Odyssey FZPIDDJSX (Open Box - Customer Return). 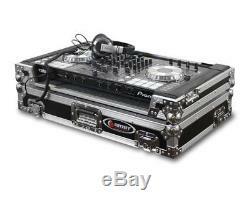 Flight case for Pioneer DDJ-SX/SX2, DDJ-S1, DDJ-T1, and DDJ-RX DJ controllers. Open Box - Customer Return. Odyssey presents the Flight Zone FZPIDDJSX case specifically made for the Pioneer DDJ-SX/SX2, DDJ-S1, DDJ-T1, and the long awaited DDJ-RX DJ controllers. It also features our exclusive, patent pending, high-density bevel foam interior that neatly angles upward raising the controller for an efficient control surface. The stylish V-Cut removable panel allows for easy access to the front controls and headphone/mic jacks. A spacious ventilation pit under the controller is ideal for storing cables and other accessories. Removable V-cut Front Access Panel. Exclusive Patent Pending Bevel Foam Interior. Plenty of Cable Management Underneath & Behind the Controller. We are authorized dealers for all these brands. We operate a 30-day return period. A 10% re-stock is more likely if the unit comes back in mint condition. Also, Items which we do not normally stock i. "Special Orders", discontinued products, close-outs, used products, etc. We strongly suggest that you check your order after receiving it to be sure that it is in proper working order. The item "Odyssey FZPIDDJSX Pioneer DDJ-SX2 Flight Case Open box" is in sale since Tuesday, August 21, 2018. This item is in the category "Musical Instruments & Gear\Pro Audio Equipment\Cases, Racks & Bags".